Sweep the roof and clear it of any debris. This step is essential if you want to have a healthy roof for a long time to come. Also, you should do this regularly, at least twice every year. 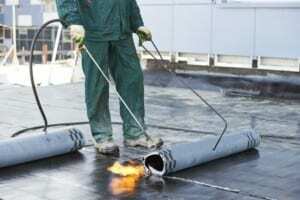 Some areas of your flat roof may require more thorough cleaning. Instead of using a regular hose, consider power washing your roof for a more powerful washing experience. Preventive measures are also necessary. For example make sure your attic has adequate insulation and ventilation. These aspects are important, since the temperature difference between your attic and the roof can cause condensation and damage over time. Check for accumulated debris, algae growth, parasites, wet spots on the attic ceiling, and anything else that might show that your roof or attic requires some repair or extended care. While getting your roof properly cleaned and checked isn’t always an easy task, it can definitely pay off. Your flat roof will extend its lifespan to a great extent, and you won’t have to worry about it needing to be replaced any time soon.